“Mary’s little lamb becomes a village child’s goats in this quirky, Kenya-set tale of making pumpkin vegetable soup. The story opens with children picking vegetables from a community garden. “But where is Kioni?” Kioni is looking for her goats. Suddenly, the text turns into a familiar rhyme, adapted to reflect its setting in an unnamed Kenyan village. Kioni’s goats “with hair of calico” almost eat the vegetables, but they make a better contribution to the soup instead (never fear: It’s just their milk). Textured collage illustrations combining natural materials and painted images show the busy children, the corn, pumpkin, sweet potato and other vegetables that make up the soup, and Kioni’s calico-haired goats. The simple text is set on harvest-toned pages opposite full-bleed pictures. At one point, two consecutive images carry the action. Two double-page spreads emphasize highlights: goats in the garden (“GO!”) and, at the end, goats and children each eating their appropriate foods. The story concludes with a recipe. Fullerton, who introduced young readers to rural Uganda in A Good Trade (illustrated by Karen Patkau; 2013), provides a positive picture of community cooperation in another rural setting, identified as Kenya in the publisher’s cataloging. “In this Stone Soup-flavoured story, a Kenyan school is busy with lunchtime preparations. While the teachers stir the broth, students pick vegetables from the community garden. Kioni is late—she’s looking for her goats, which have a habit of wandering away. Not only do the wayward animals break the “no goats at school” edict, they also wreak havoc in the garden. Frustrated by her uncooperative, stubborn charges, the young girl grumbles, “I’d like to put them in the soup.” A creative classmate sees a culinary opportunity and incorporates the goats’ milk as a special ingredient. The book’s spare text warmly invites the reader into the daily life of the village. The simple sentences have a conversational tone and the superb pacing makes for a lively read aloud. Children will also enjoy the riff on “Mary Had a Little Lamb” (“Kioni has a herd of goats, / with hair of calico”). This is Ruth and Sylvia Schwartz Award winner Alma Fullerton’s first time as both author and illustrator, and her paper-sculpture illustrations are a visual feast. When Kioni realizes the mess her goats have caused, her “oh no” moment is captured up close, as she gazes directly at the reader, hands covering her mouth with surprise and chagrin. In the field, the children’s bright clothing stands out against the leafy green background. Textures seem tactile, from the rough, peeling bark on twigs to the softly curling tufts of the goats’ hair. —Linda Ludke, a librarian at London Public Library. “Fullerton’s incredible 3D collage illustrations in mixed media fairly leap off the page and cleverly complement the text. Sticks, grass, ropes, material, and fur are all put to inventive use and enhance the marvelous paper artwork. Adding to the energetic feel of the art is the use of the bold colors and expressive faces. The book is accompanied by a recipe for Pumpkin Vegetable Soup. The back flyleaf indicates that a portion of the proceeds of the sale of Community Soup will be donated to the ‘Creation of Hope Project’ in Kenya. A website offers more information. Community gardening is at the heart of this delightful picture book, and one can sense the importance of this concept to the author. Fullerton’s dedication is worth noting. For my mother and for Grandpa Talbot, who taught me that gardening can provide nourishment for both body and soul. “This is a fun read that helps children understand the way of life of Kenyan school children and how different their life is from our own. It also describes the various vegetables and what goes into making soup and in the end even gives a recipe for making a pumpkin vegetable soup to make at home with an adult. “It’s soup day at a Kenyan schoolhouse. While the teachers stir the broth, the children gather vegetables from the community garden. All except for one. Little Kioni is looking for her missing herd of goats, only to discover that they have followed her to school and are now wreaking havoc in the garden. A frustrated Kioni announces, ‘These pesky goats make me so mad…I’d like to put them in the soup.’ This statement turns out to be a ‘eureka’ moment in that the wayward goats do make a contribution to the soup…with their milk! Fullerton’s colourful three-dimensional art, which integrates paper sculpture and mixed media collage, draws readers into that lovely far-away community garden where cooperation, sharing, and commitment are so very important. One can almost feel the textures emanate off the pages. And, as a bonus, a recipe for pumpkin vegetable soup is included. 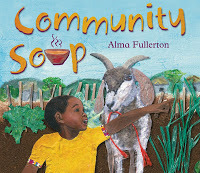 “Community Soup by Alma Fullerton is full of chunks of real stuff, and paint. It’s a story about making soup together, a little like Stone Soup, but the goats get in the garden, so there is a bit of a tie-in to a nursery rhyme, and a recipe at the end. Everyone is helping with preparing soup for lunch. Where is Kioni? She’s late! Working together the children and teachers have managed to get all the ingredients in the soup pot. Why is Kioni late? It doesn’t take long to discover the problem. Her chores at home have kept her busy, and now she is looking for her goats. Where can they be? As everyone else works, Kioni makes a disturbing discovery. Her goats have found their way into the vegetable garden where they are wreaking havoc. The children laugh and play, and tease Kioni about the misbehaviour and remind her that school is a ‘no goat zone’. She is very embarrassed and angry with her charges, and fervently wishes that they might become a useful ingredient in today’s soup. Not wanting that to happen, one of the children suggests that they might add goat’s milk to the soup and heighten its flavor. What an idea! It’s lovely for young readers to catch a glimpse of village life in Kenya. The sentences are short and tell their story with a lively pace. The textural cut paper and collage illustrations add a lovely touch, and will invite close attention to the happenings in the village as the communal soup is prepared. Bright backgrounds match the brilliance of the children’s attire and the soup recipe shared at the back had my mouth watering…it is that time of year for the comfort it brings.